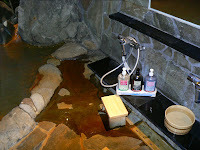 For those not yet ready to share a bath with strangers, this hotel had a private version that they labeled, "family onsen". This little gem of a house had 6 separate rooms that led to 6 separated onsens. 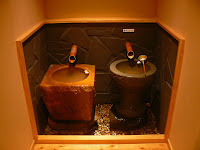 Each of the onsens had a different architecture and subsequent theme. The one I picked resembled a cave. Once you exited the cave, you were outside (still not in public view). 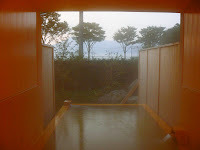 Outdoor onsens are truly amazing! It was like sitting in a jacuzzi with the ambient air temperature around low 50's/high 60's. The smell of pine permeating the air and the sound of birds (ignore those dang crows) just gave me a peaceful feeling. Just remember to drink water before you go in, lest you dehydrate.